We all know there's nothing better than fresh homemade pizza. My friend Sam Miller and I finally concocted an Italian masterpiece and Voila! 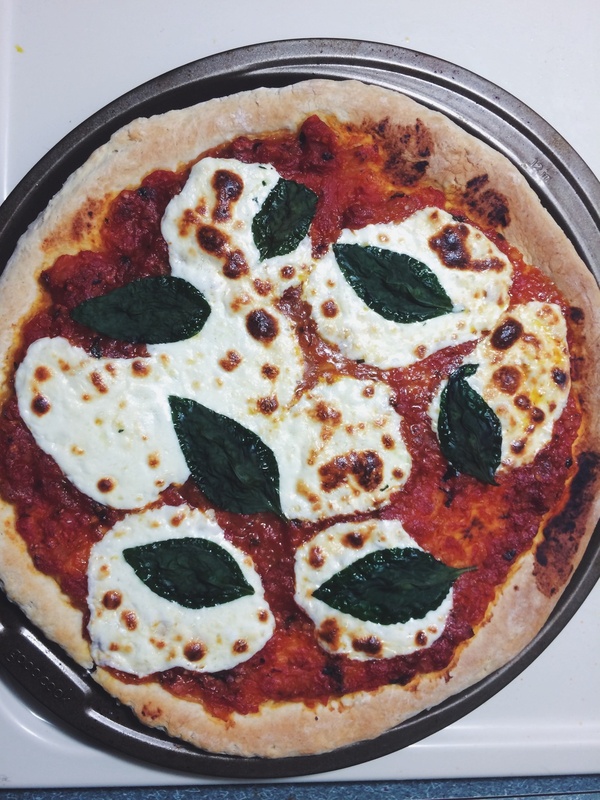 Thus was born the impeccably crisp, yet chewy, canvas for a beautiful and flavorful tomato sauce, fresh mozzarella, and lush basil. With the aromatic notes from the basil, and light flavor from the creamy mozzarella, we found the Chianti as the perfect Margherita pizza wine pairing. It was subtle and absolutely refreshing! Stir together yeast, 1 tablespoon flour, and 1/4 cup warm water in a large bowl, and set aside for 5 minutes until surface appears creamy. Add 1 1/2 cups flour, the remaining 3/4 cup water, salt, and oil. Add the remaining flour slowly until the dough begins to pull away from the side of the bowl. Knead on a flat floured surface, until the dough is smooth and elastic. Form into a ball, and put in a bowl covered with a damp towel. Let the dough rise for about 45 minutes- 1 hour. Make the tomato sauce while the dough rises. Mash the canned tomatoes to make a chunky puree. Over low-medium heat, in a small heavy saucepan, cook the onions in the olive oil until translucent. Add the garlic and cook until fragrant, and light golden brown. Add the tomato puree, sugar, red chilli, oregano, thyme, and salt and simmer, uncovered, until the sauce thickens. Stir occasionally. Dust the dough with a little bit of flour, and transfer to a pizza pan, or large baking sheet. Pat out dough evenly, and stretch into a 10-12 inch round, reflouring if necessary. Spread the sauce over the dough, leaving a 1/2 inch border. Arrange the mozzarella slices on top. Slide the pizza pan/sheet into the oven (or pizza stone) and bake until the dough is crisp and browned, and the mozzarella is golden and bubbling, about 12-15 minutes. Top the pizza with the basil leaves, and place it back again to broil for 1 minute (Note* Don't broil for too long, otherwise pizza will be burnt on the top). Transfer the pizza to a cutting board, and let cool for 5 minutes.